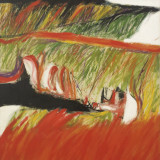 "It is not what Ireland actually looks like, except perhaps in our hearts and in our souls"
The Irish edition of The Sunday Times newspaper has printed a review of the major retrospective dedicated to William Crozier, William Crozier: the Edge of the Landscape, in its first incarnation at the West Cork Arts Centre, Skibbereen. Impressing the show's importance placed on Crozier's 'dark existentialist origin', Cristin Leach's full-length article lauds the exhibition as a 'tantalising taste of Crozier noir', lent relief with later works of 'enchanting, invigorating colour' and landscapes 'unlike the Irish landscape recorded by other artists'. The first of a two-part touring exhibition presented in conjunction with the publication of a new monograph of the same name and an Autumn exhibition at Piano Nobile Kings Place, Leach's article praises West Cork's Edge of the Ladscape for its introduction to the theme of torment and fear of the post-war condition and existentialism which pervades Crozier's work. William Crozier: the Edge of the Landscape is at the West Cork Arts Centre until 27 August 2017 before touring to the Irish Museum of Modern Art (IMMA), Dublin, 13 October 2017 - January 2018. For more information, please visit the exhibition page. William Crozier: Savagery Beneath the Surface is at Piano Nobile Kings Place from 3 October - 15 December 2017. For more information, please visit the exhibition page. A PDF of the full article can be downloaded clicking on the link below.